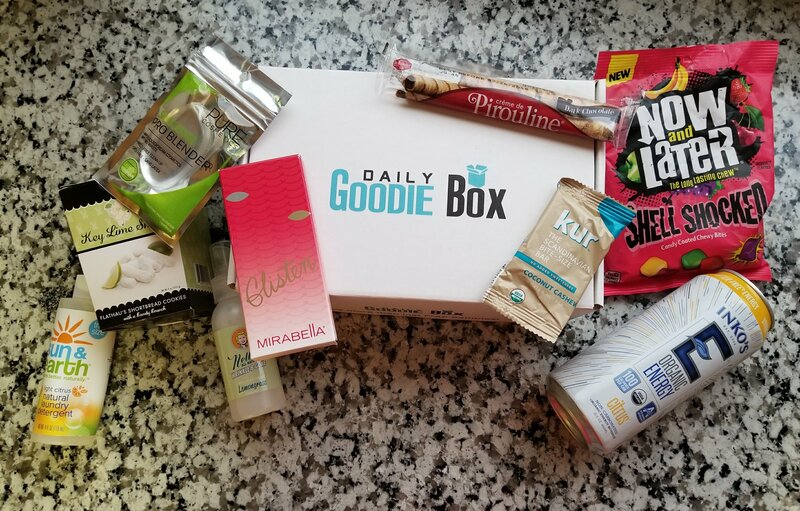 Why do I love Daily Goodie Boxes you might ask!? I support them, because I have discovered products ranging from organic, to companies who donate some proceeds. They obviously care about what products and companies go in their boxes, and this month left me amazed at all the goodies! These are sooo good! Chewy and fruity, a much different version, but just as good as the original Now and Laters. They had five flavors: cherry, strawberry, banana, grape and sour apple. All were good, but my favorite was banana. They start out with a fruity gum consistency, but quickly change to a fruity chewy candy. Now and Laters remind me of when I was a kid since they were one of my favorites, and shell shocked was a nice change without compromising quality. This whole can of Inko’s organic energy is only 100 calories! It has a subtle orange taste, and doesn’t taste artificial. It has 165mg of caffeine per can, which is almost double of what is in a standard 8oz cup of coffee. Perfect for days when you need help getting stuff doneMy verdict, light & refreshing drink that gave me the energy I needed to get stuff done almost immediately. That energy kick lasted a few hours, and I didn’t even feel it wear off; which means no groggy feeling or slump like some energy products give you. I hadn’t heard about Mirabella cosmetics before receiving this pretty little palette in my October daily goodie box, and my first impression was, beautiful neutral colors in a compact palette. The colors are perfect for fall! The shadows apply smooth, I saw no fallout, and even though they have shimmer it’s very subtle. I loved the color combo in this palette, it has warm and cool hues and that beautiful frosty white was perfect. This palette is great for daytime or nighttime looks, and you can create subtle or smokey looks. Overall, I give Mirabella’s glisten palette two thumbs up, any palette that includes reds and golds is great in my opinion; especially when they are quality and richly pigmented. If you haven’t already checked out Mirabella cosmetics, I highly recommend you do. They have a beautiful variety of natural beauty products from lips, to eyes, to cheeks. Piroulines are crispy and creamy rolled wafers, which I’ve enjoyed for years! I was very happy to see these dark chocolate crÃ¨me de Pirouline along with a $1 off coupon in this month’s Daily Goodie Box. They came in a perfect serving of two (because if you buy a whole tin it’s hard to stop at two ). These light and flavorful wafers are great with a coffee or tea, your favorite dessert, or alone. If you have never tried Piroulines, they are a treat you have to give a try! Kur is a word from the Danish language and it means “to restore to the natural or proper condition”. This bite size bar is 110 calories with 8g of sugar, Kur strives to create pure food without the added sugar. Though it’s a small bar, it’s huge in flavor. You get the coconut and cashew taste from the first to the last bite. This bar is soft, chewy and moist; truly is a natural-tasting and sweet treat. This is why I love Daily Goodie Box, they introduce me to tasty, good for you bars, from companies who care about their product’s quality. Nellie’s all natural wrinkle-B-gone is a pretty innovative product, simply because it’s a way to avoid ironing! You wash and dry your clothes as usual, and once out of the dryer, spray Nellie’s wrinkle-b-gone and smooth out the piece of clothing you want to be wrinkle-free. Below is a pre-spray and after-spray image on one of my blouses. Straight out of the dryer, my blouse was very wrinkled. I sprayed Nellie’s and let it dry for welll over five minutes. Pretty much all the wrinkles were gone, and Nellie’s left a nice fresh scent behind. This is a pretty handyspray, and Nellie’s is a great company committed to natural products.